There you are, pulled over on the side of the road. Someone has just rear ended you. You take a quick inventory of yourself, your passenger, and your car. The cops pull up and ask if you need Emergency Medical Services to come check you out. You glance at what used to be the back of your car and instinctively want to say yes, but you quickly realize both you and your passenger actually feel fine. So after thanking the cop for his concern you proceed with all of the necessary phone calls and paperwork, you head home go to sleep and thank your lucky stars everyone is ok and this night is over. Then the morning comes, or for some, two or three days go by, and it now feels like you have been hit by a freight train. Why can't you move your neck? Why do you have a killer headache? Why does your body feel like you have the flu? So, what exactly is whiplash? Whiplash is the result of a very fast movement of the neck, usually in a backward/forward motion (which happens most frequently in rear ended type accidents, but can happen in sports injuries, or even a slip and fall). When the neck moves quickly to the extreme ends of motion, tissues get injured. These injuries can sometimes be referred to as a cervical sprain/strain. This simply means that muscles (strain) and the ligaments/joint structures (sprain) have been traumatized. Typically, the most damage happens when these tissues are overstretched allowing the affected joints to be a bit more unstable than they normally would be. The body freaks out because there is nothing more dangerous than an unstable spine. So, in order to protect the injured/unstable area, muscles may start to spasm, the area may begin to swell, and movement may become very limited. So, ok, you understand why your neck feels like you were head banging at a Metallica concert last night, but what's the deal with this killer headache and why does your whole spine ache? When your body experiences something traumatic like a car accident, the force of the impact does not just go to the neck. It goes everywhere. Every joint, muscle, cell in your body experiences the impact, but to varying degrees. For some tissues (like in the neck) it can cause tears or significant damage but in other areas it may only irritate. Regardless of the extent of the damage, your body has a very specific way of healing, and it begins with inflammation. 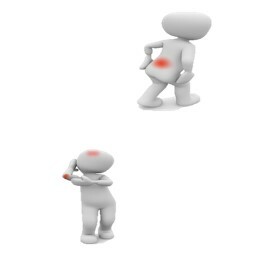 Inflammation is what contributes to the stiff, aching, sore feeling you may have all throughout your body. It can also irritate nerves leading to pain/tingling/numbness going down your arm or even headaches. Just remember, though it may be unpleasant, you are healing, so while it is necessary, it is also temporary! Now what? Rest, neck brace, who knows?? FIRST, get into your preferred health care provider (I suggest more hands on providers here like chiropractors, physical therapists, massage therapists, acupuncturists, etc) I cannot overemphasize this enough. It is so important to get proper testing and treatment not only to make sure your injuries are not more severe but also so that you begin to heal properly ensuring a higher likelihood that your pain will not become chronic. This may or may not mean x-rays. If it is not possible to get in immediately then get some ice and place it on the area of pain to help minimize inflammation. So, what else can you do at home to help alleviate your pain? Avoid strenuous activity-Your body is flooded with adrenaline and other "feel good" chemicals that may mask injuries. Gentle neck stretching- Here just some extremely gentle neck rolling coupled with moving your neck gently: Looking over one shoulder then the other, bringing your ear to your shoulder on each side, chin to chest and chin toward ceiling. Finally you can add the "sniff the armpit" stretch. Raise your arm up and rotated your head towards the raised arm, bend forward. Place hand of raised arm on top of your head and gently pull down to increase the stretch. 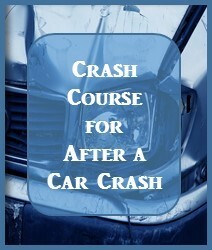 I know getting into a car accident is scary, but I hope you can use some of this information to help make the recovery process much quicker!